To make possible the printing and adherence of polymer plastics it is inherent that the surface be treated, so that the surface tension rises to a defined point. Untreated PE and PP have a surface tension of about 30 dynes/cm. Well treated PE and PP should have a value of about 38 to 41 dynes/cm for printing. Polymer plastics with a surface tension of less than 37 dynes/cm have binding difficulties. This is recognized in that the tape pull-off test has a negative result. 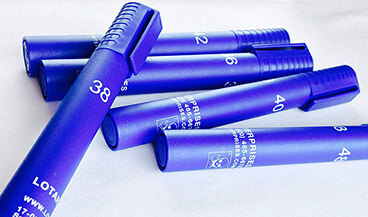 The value of treatment is tested by simply brushing the testing inks/pens onto the surface. These items have been deemed as Dangerous Goods by the US Department of Transportation and ICAO (The International Civil Aviation Organization [part of the United Nations]). Lotar Enterprises has certification for 49 CFR Small Quantities and IATA Excepted Quantities, where these items can be shipped in boxes of 200 pens or less domestically or 100 pens per box internationally to many countries without the Dangerous Goods surcharge. The pens are not recommended for metal cleanliness testing. Please call our office at 920.465.6678 to buy our inks. The odd levels are special order. Please allow four weeks for delivery. Even Dyne levels of 28 through 58 are normally in stock. Odd levels and those pens 60 through 72 are special order. Copyright © 2019 Lotar Enterprises. All rights reserved.